In a sideline of 110th centenary program in Munsung Junior Basic School, the GTA chief, Bimal Gurung appeals the people to preserve the infrastructures built by the British’s considering it as a heritage who later threw a sarcastic remark saying that the Gorkha families will soon be an endangering heritage. He proclaims that the neighboring Sikkim does not consider women married from GTA region as their citizen even after years. ‘Now Sikkim has started to throw us out from their state, Assam has already kicked us, and Sikkim will slowly induce our clan to take off from their state’ said Gurung adding the arduousness of drivers facing to run a syndicate in Sikkim. ‘Since Sikkim and Assam has excluded us from their kinship let’s build our own home here’ he said while addressing the people present in Munsung public ground. He also said that the two aforementioned states have a different perspective towards the Gorkhas residing in the GTA region. Adding to that Gurung talks about the Delhi Dharna where he egotistically said ‘We are trying to acquire a separate state and when we talked about it in the Parliament, our so called neighbor never supports us but happily takes advantage of us and when they are done using us, we are called with uncouth names.’ Talking about the unemployment of the present generation Gurung assured job for 300 youths from the department of education, ‘I have directed the education department to arrange job vacancies for 300 people and also have directed to conduct an immediate interview and shortlist them in the schools’ said the GTA chief. He later declared to reconstruct the roads of Munsong and declared funds for the maintenance of Munsung Junior Basic School, ‘I will present 60 lacks to the department of education to repair the school’ he said. While the entire primary schools under GTA region will be supported with cash of 3 crores to maintain the desk and chairs. 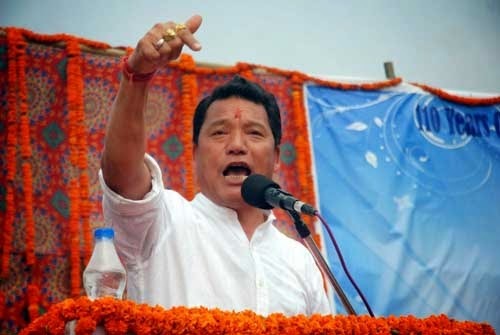 Chief Bimal Gurung accused Sikkim of chasing away Gorkhas - He proclaims that the neighboring Sikkim does not consider women married from GTA region as their citizen even after years.